A wardrobe is an essential part of any bedroom. It is the king of storage and your best ally when it comes to decluttering. Behind its doors you put clothing, shoes, bags, bed sets, you store off-season clothes, sportswear...and so on. In kids and teens' bedrooms space is never enough, not to mention that the young ones are not keen to keep their rooms all neat and tidy. A 2 door free standing wardrobe may work fine for a nursery, for toddlers and children. But let's be honest: as they grow up the amount of clothes and accessories grow with them and that cute little cupboard just isn't enough. 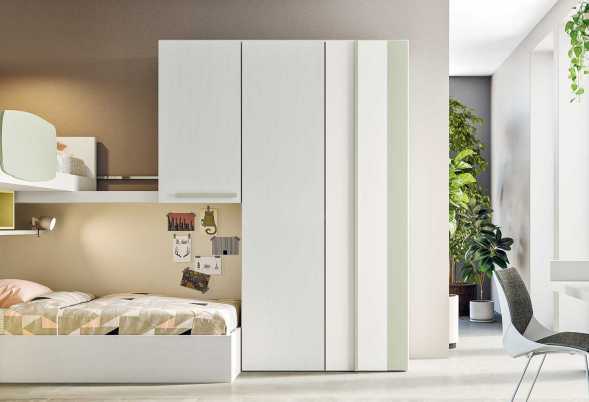 The best solution for kids and teens' bedrooms is a modular wardrobe that can be tailored to your space. With this kind of furniture you can choose size and shape (lenghth, height, l-shaped, linear), number of doors and type (sliding, hinged, mirrored, white, wooden, multi coloured). Along with the door models you can choose handles and add drawers, shelves, study tables, coat racks and even a tv space. With a modular wardrobe you get a bespoke solution without spending a fortune on a custom wardrobe. One of the secrets to decluttering any professional organizer would tell you right away is to use vertical space. Oftentimes kids' rooms are small or share spaces with lots of stuff in them: it goes withgout saying that storage is essential to better organize and keep everything in order. 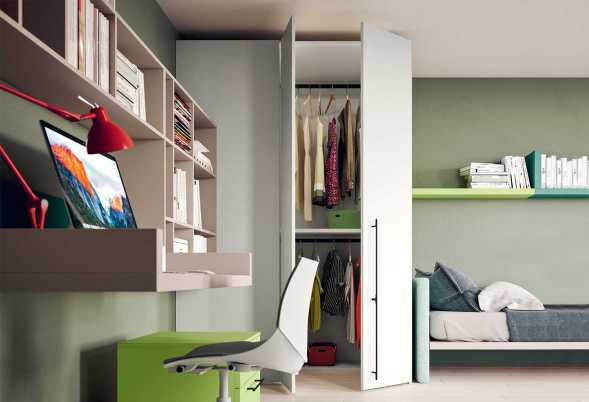 A wardrobe around the bed is the best way to make full use of one single wall. The space above the bed is hard to reach that is why you will not store here items your children need everyday. In fact overbed storage units are best for storing off-season clothes and bedding, so you will just need to climb up and fetch them once or twice a year. 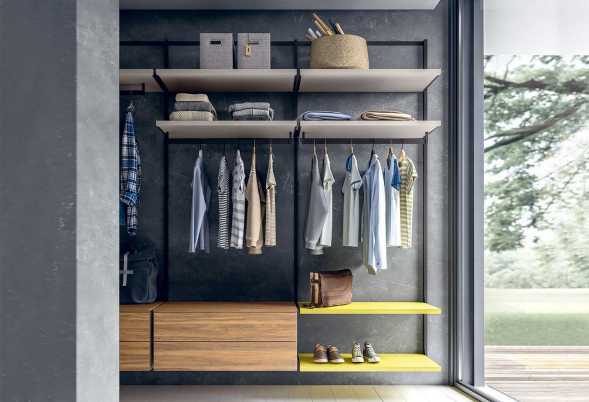 Use every bit of vertical space and you will be able to fit many many things into your kids' wardrobe. Also remember to organize the interiors with adjustable shelves, bars, hangers, baskets or boxes. 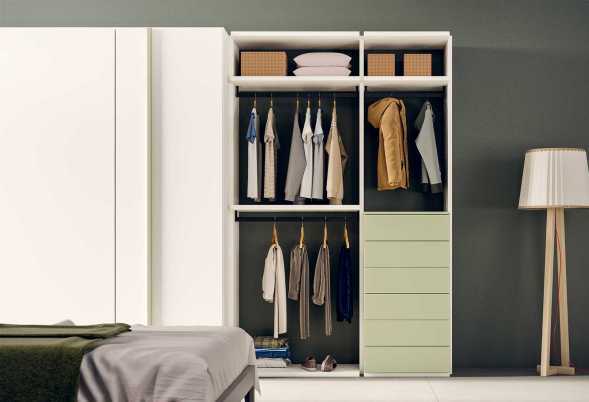 Don't stop at pictures: all wardrobes are modular and can be fitted to suit your room. 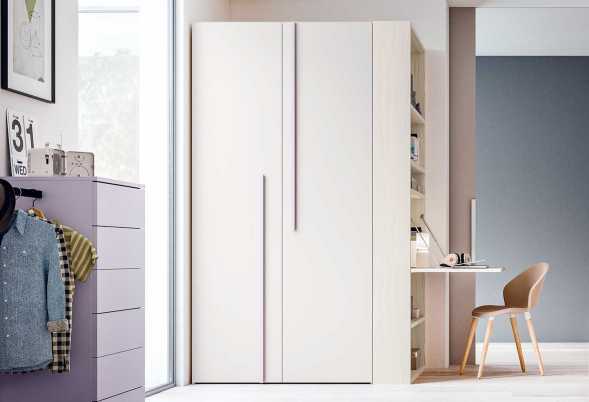 Browse through product pages to find ideas and suggestions, then contact us to find out everything you need to know about our Italian quality wardrobes, prices and configurations. 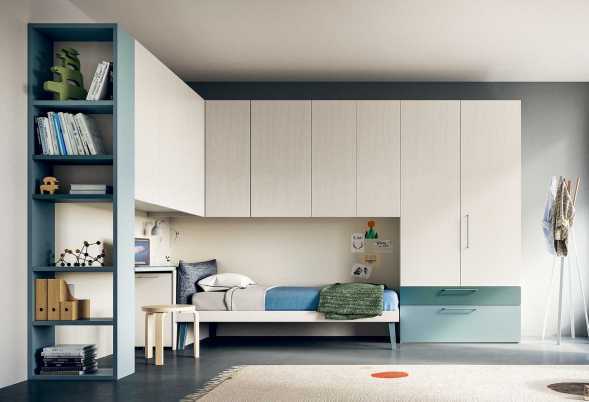 The corner overbed wardrobe Start allows for endless compositions for kids' or adults' bedrooms, guest or laundry rooms. 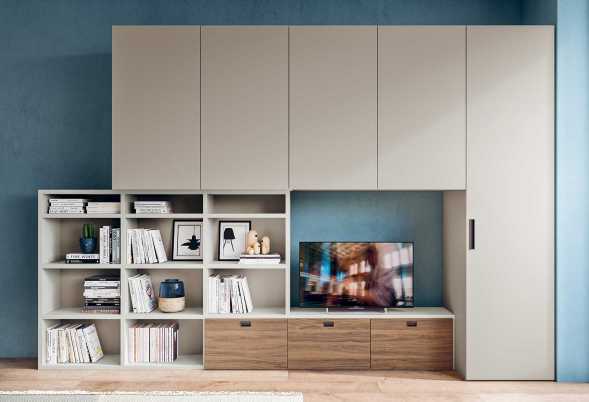 End unit can host shelves, a bookcase or a angle cabinet. Start bridge wardrobe available in several measures. 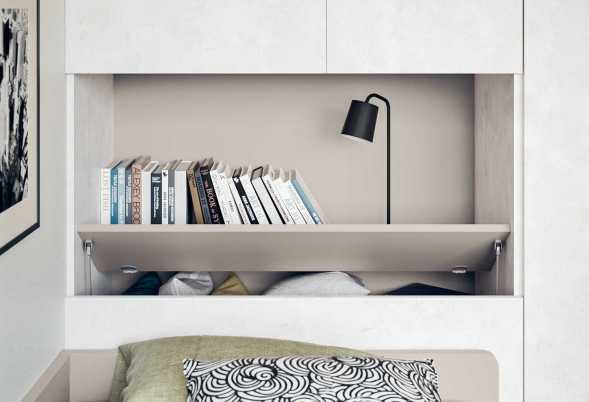 It allows to create different compositions with beds, desks and bookcases. 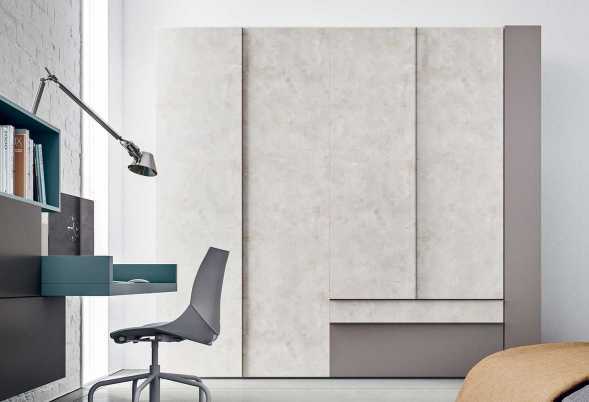 Ghost - Overbed is a wardrobe with bridge unit customizable according to your own spaces and needs. Ideal for kids or adults bedrooms. 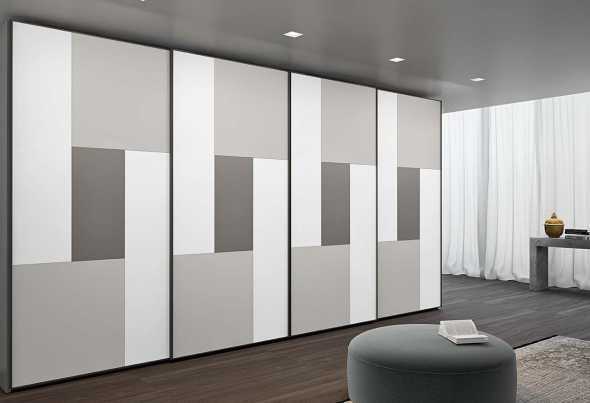 Corner is a modular corner wardrobe with a large one door unit you can combine with other cabinets, overbed units, shelves, drawers or desks. 4 different doors, many colours and handles. Stripe modular kids' bedroom wardrobe is a versatile freestanding storage solution for small or large rooms, completely customizable to suit specific needs and tastes. Duplo space saving single wardrobe can be fitted behind a kid's bed, offering a versatile solution loaded with clever storage options, an overbed cabinet and open unit with shelf. 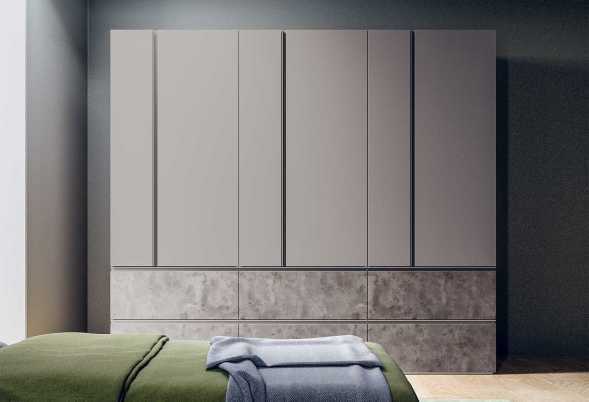 Lateral is a modular wardrobe with drawers with a stylish end unit that can incorporate a bookcase, shelves, a mirror or a handy coat rack with open storage for bags and accessories. Maxy is a two door kids bedroom wardrobe. 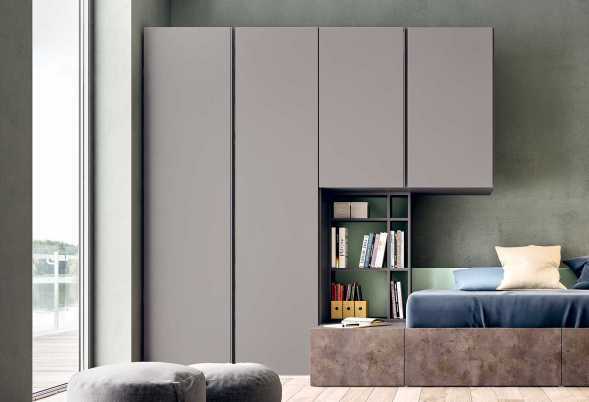 With its 1 meter depth, it is the perfect furniture solution for small bedrooms. Duo wardrobe with sliding doors for kids bedroom; made of coloured glass and available in different sizes and finishes. 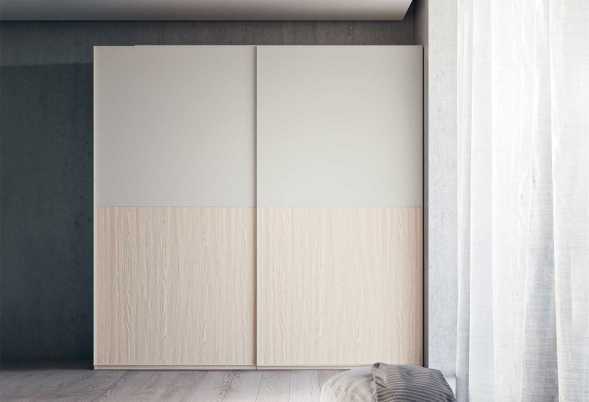 Puzzle wardrobe with sliding doors; endless chromatic combinations for kids bedroom sets. Ghost wardrobe with white doors, also available in other colours. Modular wardrobe with customizable sizes.